For other places with the same name, see Stow (disambiguation). 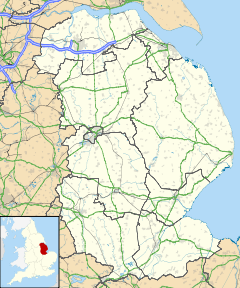 Stow (or archaically, Stow-in-Lindsey) is a small village and civil parish within the West Lindsey district of Lincolnshire, England. It is 11 miles (18 km) north-west of the city of Lincoln and 6 miles (10 km)) south-east of Gainsborough, and has a total resident population of 355, increasing to 365 (and including Thorpe in the Fallows) at the 2011 census. The parish of Stow, which extends to include other localities such as Coates-by-Stow, is today a mixture of modern brick and older stone built housing, some of the latter being thatched. The village has a public house, the Cross Keys, a Methodist chapel, and the remains of a large minster church. There is another Stow in Lincolnshire, the site of a lost village and medieval fair, between Threekingham and Billingborough. The location is now known as Stow Green Hill. There is also Shepeau Stow near Spalding. Stow dates back to Roman times and in the Anglo-Saxon period was known as Sidnaceaster ("ceaster" meant fortification or camp), lies along the B1241 road, and is perhaps most notable for its large parish church named the Minster Church of St Mary, Stow in Lindsey (known locally as "Stow Minster"), which is one of the oldest churches in Britain. Stow, which itself means "Holy Place", has a long and relatively[further explanation needed] well-documented history. There is evidence of Roman activity within the village, including the discovery of ancient coins, ruins and foundations from this period. Around 1640 a certain George Clifford, the rector's son, moved from Stow to Amsterdam. His grandson George Clifford III became the maecenas of Carl von Linné the Swedish botanist. Lying within the historic county boundaries of Lincolnshire from a very early time, Stow lay within the Well hundred of the ancient Parts of Lindsey, having previously formed part of the ancient Anglo-Saxon Kingdom of Lindsey. As a result of the 1834 Poor law Amendment, the parish of Stow became part of the Gainsborough Poor Law Union, and later, for civil registration matters, part of the Willingham sub-district of the Gainsborough Registration District. In 1974, as part of the provisions of the Local Government Act 1972, Stow was given to the newly created non-metropolitan district of West Lindsey, though remained within the county of Lincolnshire. There had been a church at Stow even before the arrival of the Danes in 870 – the year they are documented to have burnt the church down. The building remained in ruins until an abbey was built in 1040, reputedly by Bishop Eadnoth II. Dedicated to Mary, mother of Jesus, Stow parish church, sometimes referred to as the "Mother Church of Lincolnshire", is one of the largest and oldest parish churches in England. It is partly Saxon and partly Norman in date and is designated by English Heritage as a "Scheduled Ancient Monument" and was also included in the World Monuments Fund's 2006 list of the world's 100 most endangered sites. The arches in the Anglo-Saxon part are the tallest of their era in Britain. "Elnothus Lincolniensis", almost certainly Bishop Aelfnoth of Dorchester, is recorded as the founder round about 975 AD, who built the church, possibly on the site of an earlier wooden Saxon church, to serve as Minster (or mother church) for the Lincolnshire part of his large diocese. As the Lindsey diocese was the predecessor of the Diocese of Lincoln, memory of this period gave rise to the tradition that Stow is the Mother Church of Lincoln Cathedral. It is said[by whom?] to have been re-founded and re-endowed in 1054 by Leofric and Godiva (of Coventry fame) encouraged by Bishop Wulfwig as a Minster of Secular Canons with the Bishop at its head. In 1091 Bishop Remigius of Fécamp re-founded it as an abbey and brought monks to it from Eynsham, describing the church as having been a long time deserted and ruined. Within five years his successor had transferred the monks back from where they had come and St Mary's had become a parish church. One mile (2 km) to the west of the village and lying just to the south of the Roman road known as Tillbridge Lane are the remains of the medieval palace of the Bishops of Lincoln built in 1336. All that can be seen today are the earthworks of the moat and to the north and east of the site the earthwork remains of its associated medieval fish-ponds. The hamlet of Coates by Stow is 2 miles (3.2 km) to the east but still within Stow parish. There is no village here just a farm with a farmyard and a church standing nearby. The church, dedicated to St Edith, is late Norman 12th-century, but has alterations and additions up to Georgian periods, including a double bellcote. The church has a low and small nave and chancel. It contains a 15th-century rood screen, the only one in Lincolnshire. [according to whom?] The screen is Early English but has been restored. There is a Jacobean family pew at the west end and the rest of the seating is just rough benches sometimes described[by whom?] as "Rustic". There is the royal coat of arms of Charles I dating from 1635 and brasses to a William Butler (d.1590) and his wife; the figures on these are small. In a niche there is a demi-figure made of alabaster of a Brian Cooke who died in 1653. There are also small pieces of stained glass. Outside, just south of the chancel, is the tomb of the Maltby family comprising an urn on a table with tapering columns as legs, with a sarcophagus underneath. ^ United Kingdom Census 2001. "Stow CP (Parish)". neighbourhood.statistics.gov.uk. Retrieved 15 June 2007. ^ "Civil Parish population 2011". Neighbourhood Statistics. Office for National Statistics. Retrieved 31 May 2016. ^ a b c d e Genuki. "Stow-in-Lindsey". Retrieved 15 June 2007. ^ www.stowminster.org.uk. "Welcome to Stow Minster". Retrieved 15 June 2007.